[G]overnments know the names, ages and addresses of most of its citizens and… provide the appropriate polling place with a list of those qualified to vote. The voter just has to show up. We also hold elections on just one day instead of several and that day is an otherwise normal Tuesday instead of a weekend or a holiday. Those are just two examples of rules and practices that reduce voting. There are many. 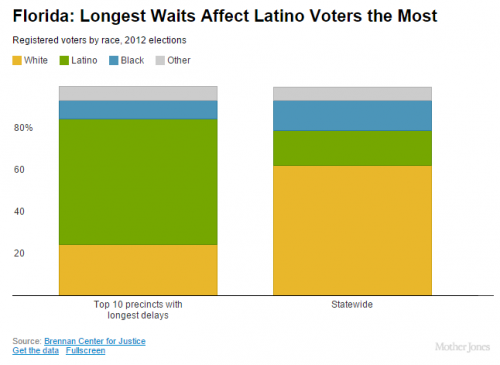 It’s called voter suppression and it’s totally a thing. 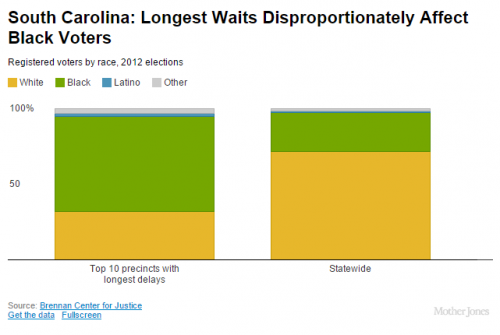 The ACLU has collected voter suppression efforts just since 2013, listing 15 states that have passed such measures. A majority of these efforts to reduce voting are initiated by the political right, as a generic search for such stories quickly reveals. They are aimed specifically at likely democratic voters, like racial minorities and students, adding up to what political scientist David Schultz argues is the Second Great Disenfranchisement in U.S. history after Jim Crow. Many of these measures are overtly discriminatory and even illegal, but others are more subtle. 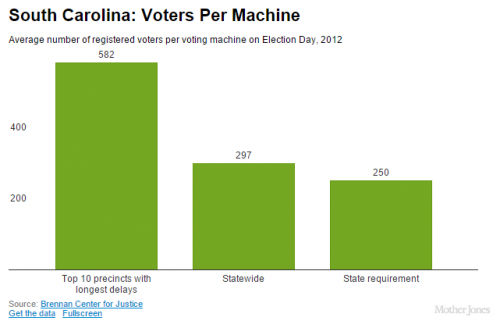 Making voting more costly in terms of time might be one subtle way of discouraging voting by some types of people. 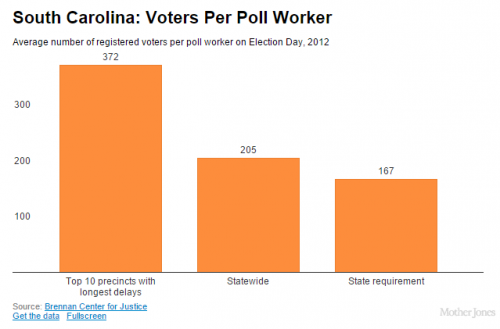 Data collected by the Cooperative Congressional Election Study in 2012 suggests that this is, indeed, part of voter suppression, by incompetence or design. There are more graphs and more details at Mother Jones. This is bad. It will be much more difficult to undo discriminatory laws than it was to prevent them from being implemented and, even if they are challenged and overturned, they will do damage in the meantime. Election games are as American as Apple Pie. Disgraceful? Yes. But its nothing new and there's only one intent: to rig the election. Gerrymandering--a sort of legal rigging of elections--has a rich and deep history here, as does voting by the dead, paying for votes, etc. Gerrymandering keeps black politicians in power and the "registering to vote" requirement means nothing: simply having an address automatically registers someone to vote. Voter ID laws are normal world-wide. They're only vilified now, in the US, because the Democrats are losing power and it's trendy to blame everything on race relations. ID is required for nearly everything everywhere. This entire ordeal is a non-issue. What about population density and racial density? It looks like in the original study they were able to reduce the racial effect to non-signficance after accounting for county/zip code. This seems to suggest that this is at least partly a product of high density and not having resources or sufficient polling places in those areas. I'd also be interested in if there have been studies that could predict these wait times using not only population density but also indicators like % white % black % hispanic in the area to see if areas with high minority density are hit the worst. Anyone know anything like that? Strangely enough, we are also the only nation (or nearly so, are there any others?) that doesn't require voter IDs. Foreign election observers are routinely shocked at our abysmal lack of the most basic measures for electoral integrity. The prevalence of early and absentee voting seem to nullify the "single day" is oppression argument. And since election arrangements are made by the local governments elected by these same minority voters, I'm not sure how those eeevil right-wingers can be blamed for them. I'll add a link to this piece. 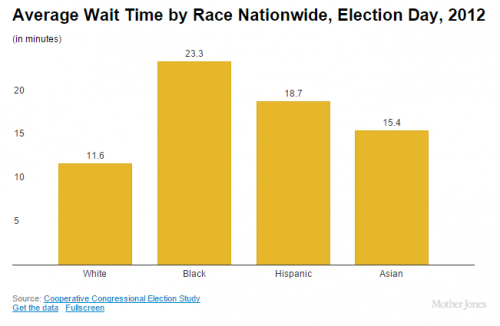 Is there any data on the 2004 wait times in Ohio where Ken Blackwell worked to suppress the vote in democratic districts which led to a Bush re-election and two likely improper right wing SCOTUS seat appointments: Alito and Roberts.